Fourteen-year-old Ashleigh Jarvis is so scared and running so fast that she doesn’t see the truck that knocks her down. Holly Blades is sixteen and a new type of policewoman – a T.P.O. or Trainee Police Officer – a new team of teenagers, recruited early and fast-tracked into the police force. After only two weeks on the job, Holly is first on the scene of the road traffic accident. But when her routine assignment of accompanying Ashleigh to hospital reveals a shocking secret about the young girl, Holly becomes convinced that there is more to the incident than she first thought. 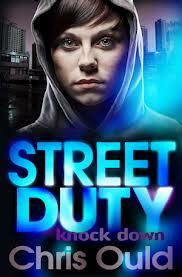 Unable to persuade her superiors that they should dig deeper however, Holly is forced to embark on a course of action which may reveal the truth, but which could also end her career in the police before it has really started…Gritty, gripping and completely compelling, “Street Duty” brings the very real world of the police force into the teen arena. Categories: Social/Family, Thriller | Tags: Chris Ould | Permalink.